I've been working on my Tula City Sampler blocks. They have lots of precise cutting and piecing, some finished pieces as small as 1/2" x 1/2". This has led me to think about how I try to piece as precisely and accurately as possible. The first important step is to cut accurately and consistently. Here are some of my tips and tricks that help me with that step. I'm a pre-washer. I prefer to remove excess chemicals before I work with fabric, and I'd like to give the fabric a chance to do any shrinking, or bleeding, before I cut and sew with it. (Fabric that enters my house -- other than precuts -- gets prewashed before it goes into my stash.) Regardless of whether you pre-wash or not, for accurate cutting it's important that the fabric is nice and flat before cutting. Iron out wrinkles and fold lines. I prefer to use a hot iron with lots of steam. And I keep a small spritz bottle of water nearby for stubborn wrinkles. The 6 1/2" x 24 1/2" is a great, utility size to start with. I use the 6 1/2" x 6 1/2" and 2 1/2" x 12 1/2" often, for cutting small pieces of fabric or trimming HSTs. I also recommend a large square. The 12 1/2" x 12 1/2" ruler is great for general use and small enough to easily bring along to classes. It's also great for trimming 12" blocks. I bust out my largest square ruler for trimming up quilts before binding. If you have difficulty applying even pressure to your ruler, especially for larger sized rulers, or if you just want to keep your fingers out of the way while cutting, consider a Gypsy Gripper attachable handle. The strong suction cups attach to most smooth rulers that are at least 4" wide. On larger rulers, you attach both ends, but the Gypsy Gripper can also be used on a smaller ruler (like the 6-1/2" square) by attaching just one suction. This one is a little tricky, but if you can arrange your work space so that you can walk on three sides of your cutting table, you'll be able to walk around to cut from the other side when necessary. 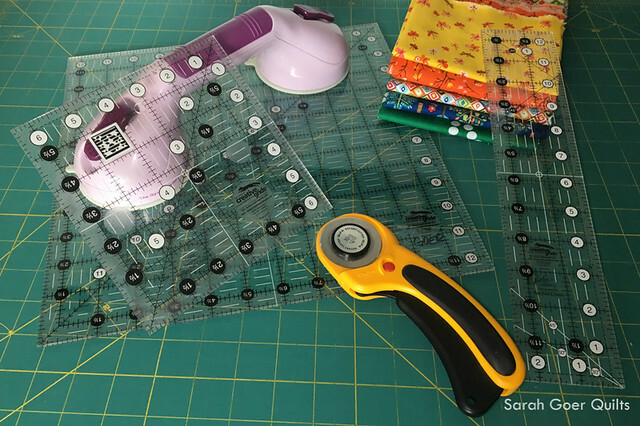 For example, after you cut off the right edge of yardage along the right side of your ruler to square up your fabric, leaving the fabric in place and walking around the table to cut your strips will result in more accurate cutting than lifting the fabric to turn it around. Another option would be to stay in place, but rotate your cutting mat on the table. I find this works better when you're using a smaller mat on a larger table. I hope you find these tips helpful. Please comment below with your best tip or favorite tool for cutting fabric. I'm linking up to Tips and Tutorials Tuesday. Posted in Quilting. Tags: quilting tip on July 14, 2017 by sarah. Great tips, Sarah! I cut with my right hand and hold the ruler with my left. I usually place my left pinky finger on the fabric just off of the ruler. That way, I have more control and less slippage especially making long cuts. Great idea! Thanks for sharing, Paige. Great information Sarah ☺ Relieved to find I regularly use the same sized rulers as you, they really do seem to cover all the bases. Although I do have a 12 x 6.5 inch ruler on my wish list as this would be easier to use on sewing days away from home, using a small mat next to my machine. Great tips Sarah. It seems we use the same brands, I use almost all the items you mention. I use the Creative Grids 12 1/2 x 4 1/2 as my small ruler, I find it the most versatile size. I will check out the Gypsy though, thank you for the tip. Thank you, Kate. The 12 1/2" x 4 1/2" sounds like a good small size as well.